Apple has finally cracked the code in China after a disappointing run for a period spanning over 18 months (6 business quarters). A dismal sales slump had all but put the fortunes of Apple in tatters if it wasn’t for some early outstanding performance from iPhone 8. 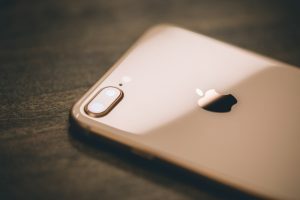 According to the latest report from global technology market analyst firm Canalys, Apple recorded 40% growth in Q3 of 2017 with an impressive 11 million shipments during the quarter. Interestingly, the iPhone 8 accounted for a higher proportion of overall sales than the iPhone 7. This will come as shot in the arm for Apple whose growth in China has been down by more than 50 percent from two years ago. One would think with the imminent launch of iPhone X Apple would maintain its upward swing. Albeit that is not the case though. Factors such as iPhone X’s steep pricing structure and supply hassles could be inhibitors in Apple’s growth chart. There is another intriguing factor at play. China is the biggest and most lucrative market for smartphone firms globally. However, it is being challenged by fast-growing markets like India and Southeast Asia. India alone overtook the U.S on shipment numbers in Q3. 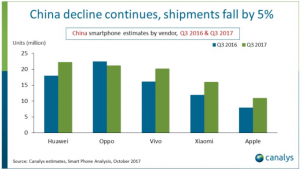 Data suggests that growth in the smartphone market in China has topped out. Which is why, Apple and many other Chinese smartphone makers are turning their sights towards comparatively smaller but rapidly expanding markets like India and Southeast Asia. According to the same report, Apple was ranked fifth based on the number of shipments and growth trajectory in China. Huawei leads the race with 22 million shipments, closely followed by Oppo (21 million) and Vivo (20 million). Xiaomi was ranked fourth. Interestingly, Xiaomi may break into the Top 3 riding high on the release of the Redmi 5A.